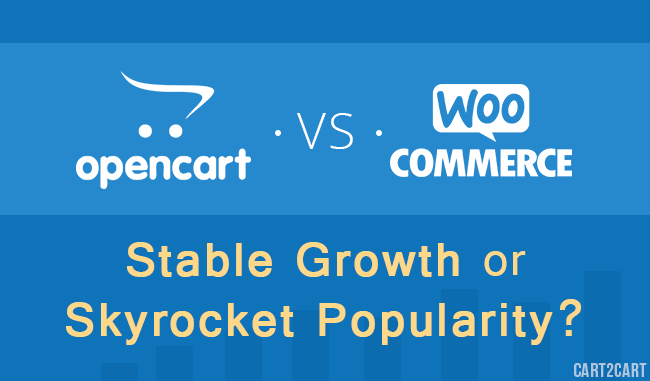 OpenCart vs WooCommerce: Stable Growth or Skyrocket Popularity? In the e-Commerce sphere, which is getting more and more accessible and offers low entry level for newbies, there are incessant debates about the toolset for business. One of the most important aspects starters face is selecting the shopping cart to base their store on. However, this frequently leaves them overwhelmed with info and unable to make their decision. This is partially due to the already well-known fact that there are no solutions suitable for everyone. Other than that, it is not very effective to ask for advice from experienced shopping cart users. First of all, they typically support their own choice as the ultimate solution. Secondly, a person that is satisfied with the functionality of their cart is not very likely to follow the latest tendencies in search of something better. This leads us to the biggest point - picking the right platform for a webstore requires the knowledge of the recent trends. Unlike in many other spheres of life, in e-Commerce the product with a long history and solid background isn’t always a more viable solution over a newer one. It is not infrequent for the shopping carts that once led the industry to be lacking features that are essential for the modern users, whereas the comparatively young platforms best reflect the latest tendencies appealing to customers. WooCommerce that was launched not so long ago, in 2011, features a rapid growth and in 2014 it already exceeds OpenCart with a history twice as long (as for now since it dates back to 2008). This phenomenon is proved by our in-house statistical data. 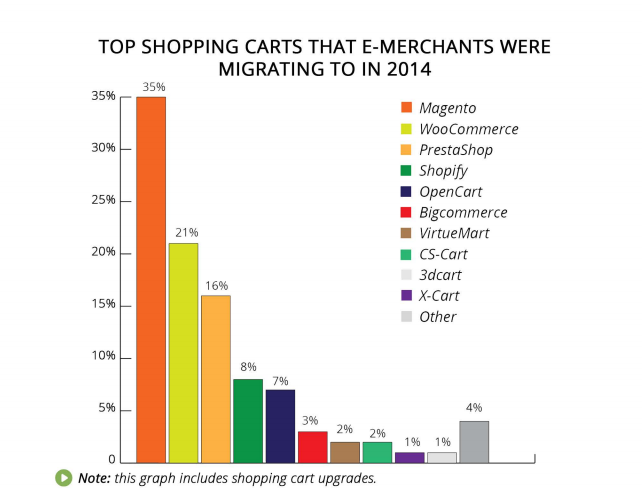 Namely, in 2014 WooCommerce was the 2nd most popular target shopping cart with 21% of all migrations performed to it. OpenCart, as the graph shows, takes the 5th position with 7% of e-merchants selecting it as their new ecommerce platform. 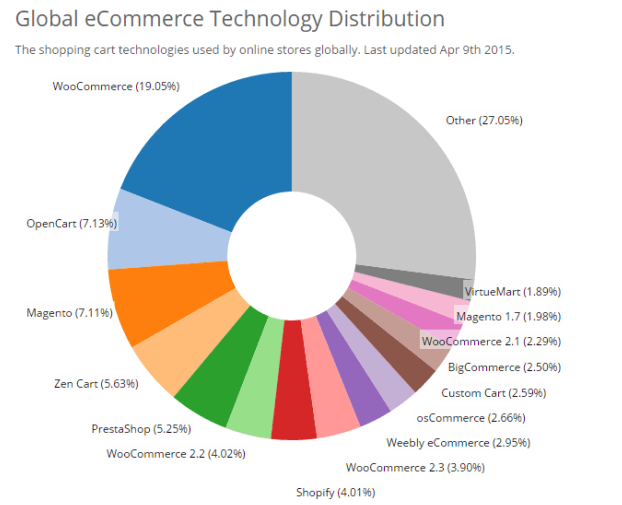 What makes WooCommerce so special? You must be willing to know what the secret behind WooCommerce is that ensures its wild popularity and helps beat one of the strongest players on the market - OpenCart? First of all, the peculiarity of this platform lies within its being actually a WordPress plugin, therefore all WP users automatically consider it one of the most viable solutions. Taking into consideration the huge popularity of WordPress, it is easy to imagine how many potential clients WooCommerce has. Secondly, it is free to acquire and very easy to install, especially for those already using WP. Third, it virtually eliminates the learning curve or makes it very short by featuring an intuitive WordPress-like interface. Next, although there are quite a number of WooThemes designed specifically for WooCommerce, it is not limited to them and can be run on any WordPress theme (however, not all of them would suit perfectly). Finally, it is not only easily customizable, but also has a really wide range of plugins from WordPress repository to complement the store with virtually any necessary functionality. OpenCart is targeted mostly at newcomers, being one of the most user-friendly solutions. At the same time, it is packed with lots of features that make it suitable for medium-sized stores as well. Unlike WooCommerce that suggests having a CMS and a website prior to starting a store, it offers standalone e-shops. This can be enough for the users who do not plan to run a blog to support their business or do not wish to set up a website first in order to add a shop to it. On the other hand, OpenCart does a good job with managing multiple stores within one interface which option is not available for WooCommerce users. OpenCart setup and maintenance costs are affordable even for startups and the out-of-the box functionality is in most cases sufficient for a basic store. It offers robust product catalogue feature set and a decent order processing mechanism. However, the number of extensions and plugins available doesn’t near that of WordPress (and Woo, correspondingly). It’s not very easy to customize, too, and lags behind in terms of performance (the problem is solved via additional plugins). So, looks like we’ve got very strong competitors today, and regardless of the above stats you should weigh all the pros and cons of each solution carefully before opting for one. If you happen to own an e-shop already that runs on WooCommerce, but consider OpenCart as the target cart candidate, you can perform a quick WooCommerce to OpenCart migration. If the situation is quite the opposite and you’d like to try out the advantages of WooCoomerce over your OpenCart, it’s simple to switch from OpenCart to WooCommerce and check it out.